I don’t remember who responded first. In my memory, it is as if my parents spoke simultaneously, when they said – in reference to the third college I was already attending – “Oh, we thought you were going to tell us you wanted to change schools again.” As if that would have been the most devastating news I could have shared. No, nothing that important. I grew up in a very religious family, one where there was no discussion of homosexuality and one where we didn’t know anyone who was gay. Because of that and because of the conflicts I had had with my father, I didn’t know exactly what to expect. My worst fears and expectations never materialized. At that moment – well, after the statement about changing schools – my parents said exactly the right things. They told me that their biggest concern was that I was happy and they would love me and accept me for whomever I was. Truly, I couldn’t have asked for anything more supportive than that. To this day, I don’t know the full story of what my parents’ feelings and reactions were. Each of them has shared a little bit with me about the other’s reaction, but I’ve never asked in detail. I’m sure for them that it was a shock, something they probably didn’t see coming, and something that they had to struggle with in order to arrive at a full understanding. For both my parents, with their strong roots in the Christian faith, praying and soul-searching was probably necessary. For my father, a consummate perfectionist and the type of person who spends a half-dozen years researching cars before finally buying a new one, a lot of reading and research was necessary for him to understand what all this really meant. Life continued much as before, occasionally with some questions from my parents. Over the months and years, my relationship with my father strengthened, connections that had been missing in my teenage years finally started to form. My suspicion is that my coming out helped my father reach a “love him or lose him” realization. If I was going to be a part of his life, it would be as who I was, not who he might have wanted me to be. I don’t know this for a fact, but I suspect it. Eventually, I met my first boyfriend. I suffered my first heartbreak. And eventually, I healed and moved on to the next relationship. Along the way, my parents were always welcoming and supportive, even if there was sometimes an awkwardness in the room. Eventually, that awkwardness faded and it got to the point where the men in my life – finally, Tawn – were welcomed into the family unconditionally. The coming out process continued, of course. It never does end. My parents spilled the beans to my sister – sort of a funny story there – and then my mother outed me to the family through her weekly family letter. In it, she rather bluntly explained that if anyone in the family had a problem with me being gay, that they should recognize that it was their own problem, not mine. Needless to say, there were problems and different family members approached the news with different levels of acceptance. Over the past fifteen or so years, we have all worked together to learn and grow and understand each other better. It was at our wedding reception this summer, with my grandparents, aunts and uncles, cousins and immediate family in attendance, that I realized that we – the whole family – had finally made it fully out of the closet and past the field of detritus that is often scattered outside one’s closet door. Along the journey I’ve been very fortunate. I’ve only had one friend who ended the friendship after I came out. And there has never been anyone who has reacted negatively to my face. Traveling and working abroad, I’m more guarded about what I say and to whom I say it. But at home in the US, when asked if I’m married, I can answer honestly, proudly, and comfortably that, yes, I am married to my husband. As I read the article in the NY Times about these young people coming out, I’m filled with so much admiration for them, for their bravery. I’m also filled with a little jealousy, wishing that I hadn’t spent nearly twenty what I consider to be wasted years staying in the closet. I say “wasted” because those were years in which I never felt okay about myself, never accepted the wholeness of who I was, and always lacked the confidence to embrace myself. I know that coming out is still a difficult journey for gay, lesbian, bisexual, transgendered and questioning people. Not a month goes by free of headlines about brutality towards someone just because of their sexual orientation. There are families far less accepting than mine, workplaces far more hostile. The journey to the closet door is unique for each of us. Ultimately, I hope that for each of us, the journey doesn’t end there. A few days later, my parents wrote sent an email responding to my coming out story. You can read it here. This entry was posted in Personal and tagged Adolescence, coming out, Gay, homosexuality, identity, journey, Personal, sexuality by christao408. Bookmark the permalink. Oh Chris, you wrote so well and I had the easy part. You did 99% of the work, I only had the 1% as the back seat driver… uhm editor. Bravo to you for sharing your heart with all of us. I know your story will touch a lot of people. I love that quote and I’m glad to hear a very positive coming out story. It’s a good way to remember that the acceptance we’re striving for is out there.Thank you for sharing. Bravery is what we all need, gay or not gay. We should have the bravery to point out what is wrong and try to right it. Congratulations on you coming out successfully! Congratulations on your successful and happy marriage! Very touching story. You have my full support. It’s a quite adorable four-chapter story about coming out. Chris, you have a very understanding and supportive family, which makes it a little bit easier for the ‘coming out’ process. And I think Mattie did a great job as the ‘back seat driver’/editor. Maybe we should encourage everyone to write about their ‘coming out of the closet’ stories. @CurryPuffy – Great idea and we can send them all to Matt to edit! @ElusiveWords – The race is won in the final meter. @rafi09 – Thanks for reading it and commenting. Much appreciated. @choyshinglin – That really is the moral of the story, isn’t it? Thanks for your support. wonderful series of articles. very touching and heart-felt! very happy for you with your understanding parents, and a wonderful partner! It’s good to hear that your worst fears and expectations were not what ended up taking place — isn’t that so often how it goes, with many a significant thing? Something inside me cheered for your mother when you wrote of how she told the family in the weekly letter.Bravo, Chris. I’m so glad your family has accepted you and embraced Tawn too. It is a touching story – I hope others can have a positive experience when they reveal their true selves. wow, you’re married! how awesome is that. Chris, being your cousin, and so far away in age, I never really knew or understood, (when I was younger) what you had been going through. I never thought twice of your life style when I was younger, you were my cousin and family and just enjoyed spending time with you, and I love you regardless. But I have to say that it takes soooo much courage to share what you had gone through with everyone on your blog. Some people would never be able to doing something like this. It was a wonderful story to read. I’m soooo happy for you and Tawn and how happy you guys are together. I wish I was there for your wedding day. Best wishes for you and Tawn both. Can’t wait to see you guys. You’ll have to come soon and see Thomas James Wong. He is the cutest kid. Love you guys. So glad to hear that your parents accepted you as you are, albeit initially a little lost on the details I’m sure. And admirable how your mom told the family that her acceptance of you is unquestionable. And even more wonderful that your relationship with your father started to mend as a result of your coming out; that was truly a gift.I like the symbolism behind your picture…that you are standing on top of the world because you have embraced who you are. I teared up as I read this. I can’t even imagine how good it must have felt to finally be upfront with your family about who you are and have them simply accept you unconditionally. That must have been one of the most amazing feelings in the world! Thank you so much for sharing this with us! @doiturselfer – Thanks for recognizing the symbolism; I spent a lot of time pouring through photos roughly from that era to choose an appropriate one. 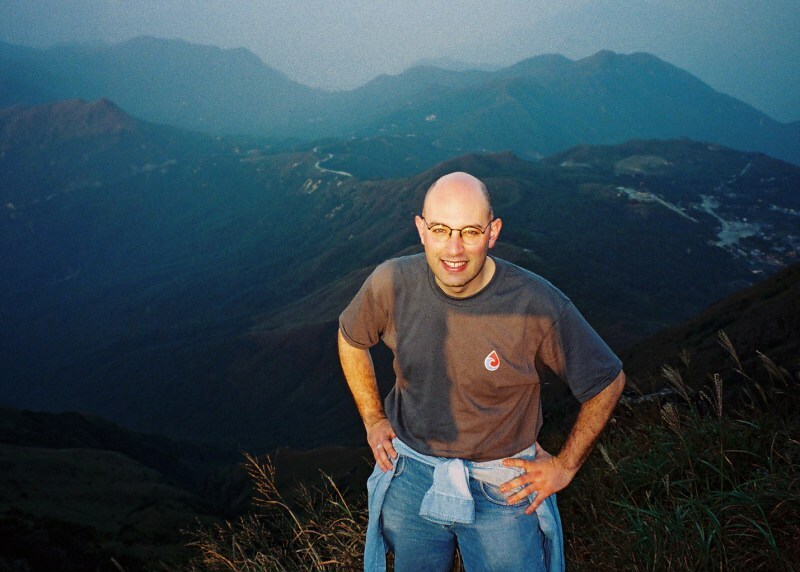 This was taken in 1998 shortly after I moved to Hong Kong. I joined a group of friends on an ovenight hike to the top of Lantau Peak to watch the sun rise. It does represent the point where I had achieved a healthy and happy balance between all aspects of my life. @Rm2046 – Yes, I am very lucky to have such accepting parents. As for representing the closeted people, I know that mine is just one story among millions, and that each of those stories is equally, if not more, compelling. @TheCheshireGrins – When friends who are Christian talk about being born again, this is what I imagine it feels like. Shedding a cloak and stepping out into the truth does feel so good. Thanks again for your comments and support. @MaggieGG2 – Thanks, Maggie, for the kind words. It is interesting, isn’t it, when we know just one side of a person’s life? It really paints a certain picture that may only represent where they are now but not necessarily where they came from. I’m glad you enjoyed the writing. @Redlegsix – Ruth Ann, this is what happens when you read all the entries at once instead of slowly savoring them! =D I’m glad that you found some understanding; I think that more than anything, if my sharing this story can help people understand some of their fellow humans a little better, then it has been worth it. Thanks. @yang1815 – You’re very welcome. Thank you so much for sharing. I’m sorry to hear about that broken friendship. That’s just awful, but then again maybe it wasn’t meant to be. Hi Christopher… my first ever comment to your welcomed blog. I can say that knowing you since Jr High, your confidence has never simmered. And even though I’ve only grown closer to your parents in the last decade, their love for you, and Tawn, was so eloquently expressed at your summer wedding. It brought tears to my eyes and shakes to the camera I was trying to hold up to video-record it all! Love to you, to Tawn, and to your wonderfully supportive family. It’s my turn to respond. The thought that one of our children would have this sexual orientation was the farthest thing from our minds when you sat down to tell us. Your readers need to know, however, that our Christian beliefs led us to understand that if we are to follow the teachings of our faith, we must love each person in our lives for who they are, not because they fit some pre-condition that allows them to be loved or not to be loved. When you came out to us, while unexpected, it was not something to reject you for, but to realize that we had a journey to take together…you needed to continue your self discovery; we needed to discover how, as your parents, to support you while allowing you the space for your own discoveries. Once Dad and I became comfortable with our place in this journey, we were then able to take a stand with the rest of the family and invite them to join us or go their own way. You shared several things I didn’t know, but am happy that you felt comfortable sharing them. We would have been devastated if you had followed through with that suicide attempt. I wasn’t totally oblivious to a struggle going on with you, but probably chalked it up to being a teenager. Could we have helped if we had known what you were experiencing? I don’t know. Our individual road sometimes needs people helping us along the way other than our parents…hard to take as a parent, but we are too close to the situation most of the time for objectivity. Fortunately, you made choices that led you to a full life, including seeking out people to walk with you. Thank your for sharing your story. Thank you for the opportunity to add my ten cents worth. @jandsschultz – I was actually going to ask you to write a guest entry for the blog so that you could share the whole story. I’ll copy your words into another entry, though, so that everyone else can read them. Chris — This has been a beautifully written account of your coming out experience. And I am extremely impressed with the supportiveness of your parents when you came out to them — you are very fortunate! What a dichotomy they dealt with, with their Christian beliefs not supporting you but believing that your happiness was of primarly importance — congratulations to them for doing it successfully! And thank you for sharing this with us. @slmret – You’re very welcome and thank you for the kind words. Hi Chris. I was on vacation this past week and missed reading a lot of things. I have now read all of your entries here, and I wish you could see me now. I stand and salute you dear friend, for your honest and forthright post over several days. Bravo! You have to be a role model for so many of the younger people. I have loved knowing you, and I am sure each person who has come to know you, must feel the same way as I do. God grant you happiness and health always. Hugs and much love. @jandsschultz – Thank you for being such amazing parents! You are truly blessed and have become a blessing to many! Thank you! @ZSA_MD – Thank you so much for the kind words Zakiah. I hope you had a wonderful vacation and am glad you are back. I just finish reading this final chapter ( I’ve been away for a week’s vacation). This is so beautifully written, very touching, with a nice, happy ending. You’re so lucky to have such an understanding, and loving parents, who gave you the inner strength to move on. @icapillas – Yes, I am very fortunate indeed. Hope you had a nice vacation and thanks for following up on the series.